Reliant Finishing Systems manufactures stainless steel wash enclosures that provide an effective and economical alternative to conventional multi-stage washers. Our wash enclosures can easily be customized for cleaning and pre-treating parts of any size. Using a multi-purpose wash bay instead of a linear washer with fixed stages can save lots of valuable floor space. You can get results that rival the best conveyorized wash systems, but these enclosures are a fraction of the price. In addition to the massive cost savings, manual wash enclosures give you much more versatility than conventional pre-treatment lines. Reliant’s wash enclosures work great with pressure washers or wand-type steam generators. Operators manually treat parts in batches that are moved into the wash enclosure on carts or rolling racks. Our most popular wash enclosures are used for degreasing, cleaning and phosphatizing parts to prepare them for powder coating or painting. They feature stainless steel vapor abatement fans, vented stainless steel doors, and customizable controls in NEMA rated enclosures. 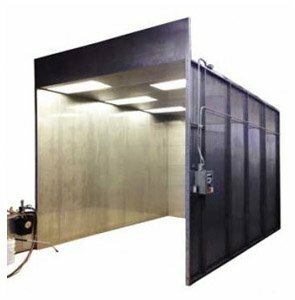 If you need a pre-treatment unit, we’ve partnered with industry leaders like Electro-Steam, PEM and Sioux to offer a variety of pressure wash, dry steam, and manual chemistry application solutions. We also build gas, electric and IR drying ovens for drying parts after they have undergone pre-treatment. Best of all, we offer package discounts to clients who need multiple appliances!